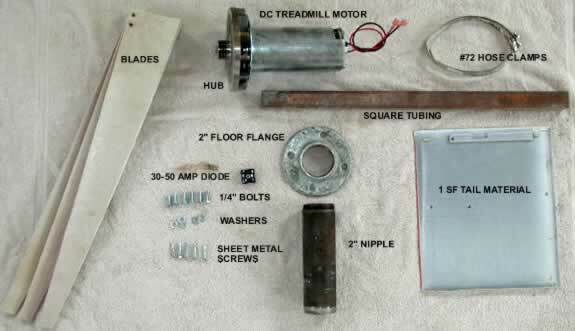 Building a Small Wind Turbine can be an easy and very educational experience. It is important to examine each area of the wind turbine to understand the operation of the machine as a whole. The Chispito Wind Generator is a open-source wind generator project that can be built by anyone with modest tools. Each component is designed to be harvested from a landfill or surplus store. The blades are made from 8" PVC sewer pipe, the motor is a permanent magnet treadmill motor, and the tail can be made from the case of a washer or dryer. The Chispito Wind Generator is a beginner level wind generator designed to be an easy to build entry into the field of home-built wind turbines. Most of the parts can be salvaged from the local junk yard, and construction is limited to basic tools. The wind generator can produce about 100 watts in a 30 mph wind. Two people can build a Chispito in about three hours, if they have all the tools and materials required. The cost should be under $50. Sourcing parts can be difficult for some areas. On the website, , we examine possible solutions to hard to find parts. Also, wind generators can pose a threat to people and animals. Always stand up wind from a wind generator and never let it free spin. The wind generator should also be connected to a load or be shorted out. 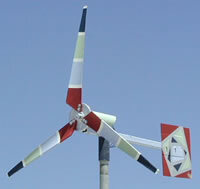 The Chispito wind generator is capable of 100 watts in a 30mph wind. We have used three of these machines in parallel to power our off-grid home. Coupled with a properly sized battery bank, the Chispito Wind Generator can be an excellent addition to your power system. This page was last edited on 4 August 2011, at 15:25.